Gamification and game based learning is getting significant love in schools around the world. Used correctly, games can teach academic concepts and skills in ways that students who struggle to learn by traditional methods can more easily grasp. Games can also be great ways for students to demonstrate what they’ve learned. Gamification brings an instant increase in student engagement that is hard to replicate. One favorite game in my History class is Socratic Smackdown (instructions, materials, and tutorial on the right hand side of the page) designed by the Institute of Play. It takes the great discussion and questioning method of Socratic Seminars to another level. I have done it for a couple of years now and immediately after finishing each one, students are asking when our next Smackdown will be. Socratic Smackdown helps me to further develop Global Competency in my students. The game develops communication skills and exposes students to different perspectives. 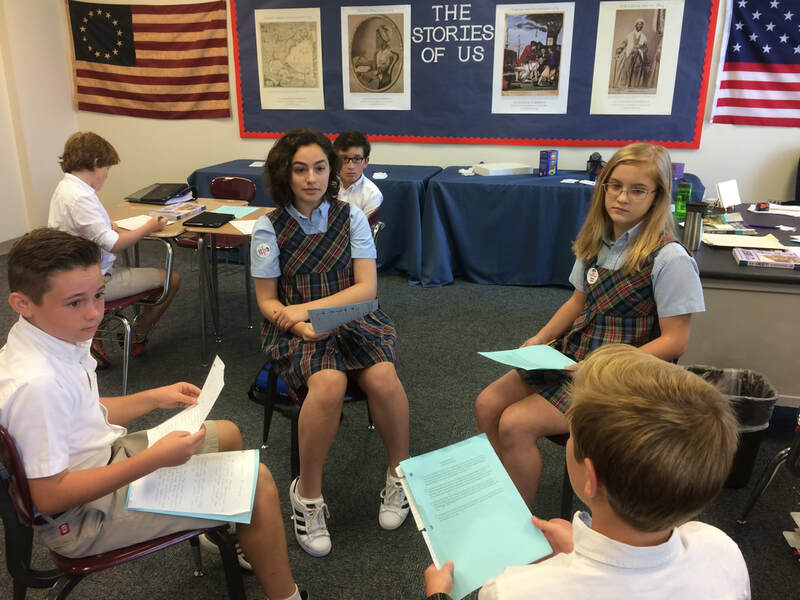 If you choose a global topic to be discussed in the Smackdown, you deepen students understanding of issues facing the world and foster an interest of others and issues beyond their zip code or borders. The goal of the game is to be the team that scores the most points using different discussion strategies. Students who are not actively debating in a round will be engaged by being scorekeepers using the scorecard template. This is perhaps my favorite part of the Smackdown. In all the times I’ve done this, I’ve never found a student disengaged or not paying attention. This year, I did my first Smackdown the second week of school. The first is always the most awkward because students are learning discussion skills, how to have a deep conversation, and how the Smackdown format works. However, each Smackdown shows students making significant progress in their abilities to formulate arguments, ask and answer deep questions, and comfortably discuss controversial topics. Before class I randomly divide students into 3 or 4 teams (more than that makes it easy for one person to contribute little). Pass out the news article or text that gives students background of the topic. Pass out the questions that we will be discussing during the Smackdown. Give students an adequate amount of time to prepare their opinions and support. Have students decide who will represent their team in each round (coinciding with a different question). Pass out the scorecards and explain/remind students about which discussion strategies will score them points during this Smackdown (I write these on the board). Students representing their team during round one (question one will be debated) enter the fishbowl (see pictures below). You can come up with your own name for the debate arena. I read the question out loud and start the timer (no less than 4 minutes, no more than 6). I walk around and listen to the debate and observe the scorekeepers. If conversation gets off topic or if there is a lull, I may interject a question or comment to get it going again (I rarely have to do that though). After the timer goes off, I usually thank the students for sharing their thoughts and respectfully disagreeing. I may even compliment a specific student or two for great comments, especially if it is a student who is usually quiet or not used to excelling academically. Call for the next round and repeat. At the end of the debate, I collect the scorecards and tally the scores that evening (we always go to the bell). The next day I announce the winners. Students are usually bursting through the door the next day asking who won. It makes for some great positive energy to start the next day’s lesson too. The key to success is choosing interesting topics and questions. Here is a link to my Columbian Exchange Smackdown questions. For this one students watched a John Green video about the impact of the European “discovery” of the Americas. Students had already been introduced to it in a previous lesson in class. They are encouraged to take notes during the video as they would need to offer specific details to support their opinion during the Smackdown. Consider blocking off two days for your Smackdown. Depending on how long your class periods are, you may need to do the prep work the day before (i.e. students watch or read about the topic while taking notes the first day and then debate the second). Modify the game to fit your kids and time frame. Though I love the idea of the Coach’s Card, I don’t use it for time purposes. Same for the Instant Replay card. Though I am considering making more time for this as self-reflection is so important to personal growth. If you have students with personal devices (i.e. iPads, Chromebooks, etc..) consider extending the Smackdown to the virtual world with Flipgrid. Students must post a short video with their response to the question. 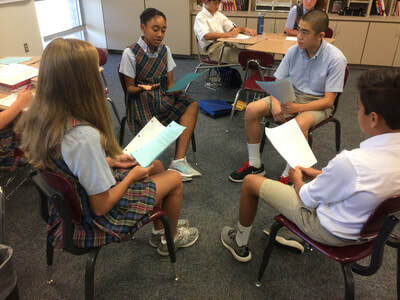 Then, they must respond to 2 or 3 other students using the same discussion strategies discussed in class. I will be trying this one this year and will update on how it went. 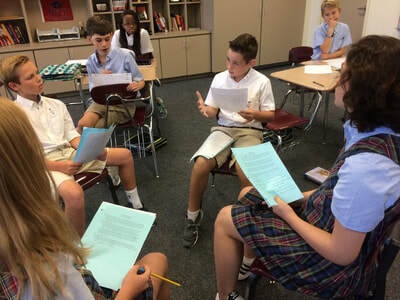 Socratic Smackdown is great for any subject area. I’ve used current events and controversial issues as topics. I can envision topics for Science and ELA classes easily. With a little creativity Math could make it work as well. 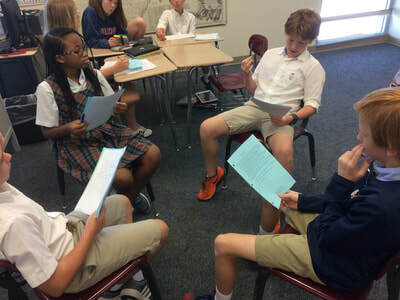 It would be cool to see students debating in their Foreign Language class too. The topic could be something school related (or something very familiar), but students would have to debate in the foreign language. If you have any questions about how I run my Socratic Smackdowns, feel free to post your question or email me. If you have tips on doing similar activities, please post them for other teachers in the comment section. 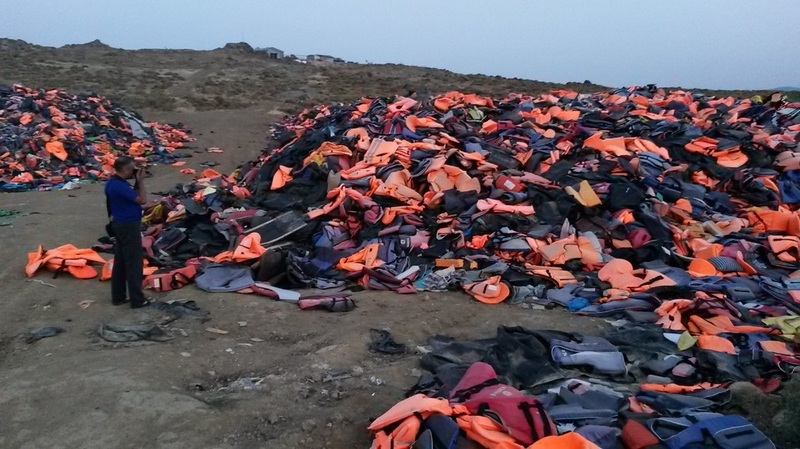 Lessons Fr﻿om Lesbos: Who Isn't My Neighbor? Five days ago we said goodbye to Greece, goodbye to Lesbos, goodbye to the camp, and goodbye to the faces that we had familiarized ourselves with over the last week. Undoubtedly, the latter was the most difficult to say goodbye to. Face of men, women, and children who are living a life we can never imagine. For myself, goodbyes are typically never that difficult. I've rarely said goodbye to someone who I knew I'd never see again. This goodbye was different. What do you tell to someone in that situation when you are saying goodbye? What do you tell to someone who you know you'll likely never see again? 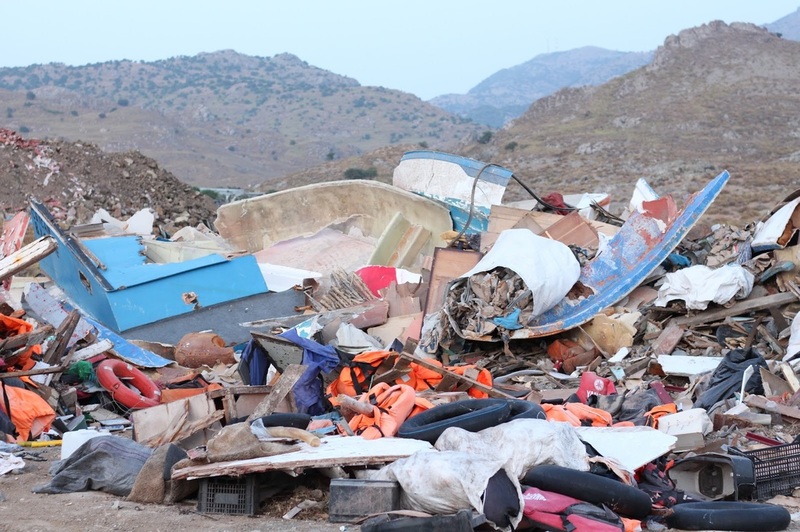 For the thousands of refugees living on Lesbos and the hundreds-of-thousands more around the world, goodbye is something they said to their homes long ago. Goodbye is sadly a conversation they're very familiar with. However, with each goodbye, as I learned over the week, comes a glimmer of hope for the future. Every one of those hundreds-of-thousands knows exactly where they want to be and exactly when they want to be there. The best I could do, when saying goodbye, was to express my hopes for their future. Hopes that they find what they're looking for. Hopes that their lives are blessed in the future. Hopes that maybe someday our paths will cross. Hopes that the world welcomes them with open arms in the same manner they welcomed us. Hopes that someday I'm lucky enough to help others in the ways they've helped me. Above I asked you who your neighbors are. Look at the map above depicting migration to the United States (click the picture to see the animation). Who isn't your neighbor? Is it possible that someone you have never met and may never meet in your life could be your neighbor? If you believe the world is more interconnected than ever before, the answer to that question is yes, they are your neighbor. All those things you said you'd do for those living directly near you, I urge you to do for all of mankind. Last night, someone asked me if "it has all set in yet." I'll admit, I wasn't prepared for that question and wasn't exactly sure how to answer it. Has it all set in? I don't think it will ever fully set in. Once you experience something like that, how do you go back? How do you ever look at life the same way? The answer is, you don't. For that, I'm thankful, because I don't want to. If you've ever visited another country, you are sure to understand what I mean when I say that people from other countries are so hospitable. From greeting you with "Hello, my friend!" to inviting you in for tea, hospitality is something that permeates cultures around the world. Our experiences in the Moria Camp reflect that perfectly. I told you about the first day, when Johannes and Imanuel, our Eritrean friends, invited us inside their tent structure for some much needed respite from the hot sun. When we wanted to help and serve them, it was they who were doing the serving. Many of our lives have been touched by individuals in the camp who we will never forget. I have been working in Level 2, which is a family unit of about 100 refugees from Afghanistan. All of them are Afghan and have fled the terrible situation there. I have spent two days there and some of my experiences have changed my life. Today, there was a sweet little girl named Rhiana, about 5 years old, who I was talking with while I was on gate duty (this part of camp has a large gate to protect the families). She has lived in the camp for 3 months now. She has a total of 8 brothers and sisters who are living there with their parents. She had a very pretty necklace that had been woven out of simple string. I told her that I thought it was very pretty and she smiled and ran off. No more than 15 minutes later, she was running back to me with my own woven bracelet, eager to wrap it around my wrist. "Green, red, and black, the colors of Afghanistan!" she declared as she grabbed my wrist and wrapped it tightly. I hope it never falls off. In many of the communities, some of the men have stepped up to take on leadership roles. These men work with Euro Relief and receive a large amount of responsibilities such as passing out meals to the families, guarding the staff shack, operating the gate, and resolving conflicts among the families. One of these men in Level 2 (the Afghani community) is named Shefi. Shefi is an 18 year old who has lived in the camp for 3 months. He dreams of moving to Germany to open a mechanic shop, a job that he performed back home before fleeing the wars. Shefi is an incredible person and has a huge heart. I met him yesterday, talked with him a good bit, and hit it off again today when we worked together. This afternoon, as I was guarding the gate, Shefi came running to find me. I was worried something was wrong. He grabbed my hand and repeated, "Ryan, come, Ryan, come!" I went with him into the staff cabin and was immediately brought to tears. 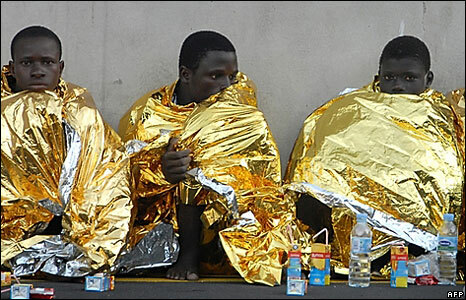 On the floor, Shefi had laid out one of those gold foil emergency blankets that you'd find on a boat or a raft. You know those ones that are meant to keep you warm at night when it's cold? This type of thing. On the blanket he had laid out 7 meals. 7 of his own meals that were delivered to him that he was meant to eat over the next few days. With each meal, a fork, a piece of his bread, one of his juice boxes, one of his bottles of water, and two large communal bowls of traditional Afghan side dishes. "Come, sit my friend" he said as I held back emotion. Sitting there with me were 4 other volunteers with Euro Relief, Shefi himself, and Sha', a British girl who does a lot of translation work for the camp. Our wonderful host served us food, on the floor of a refugee camp, sitting on a gold foil blanket. While it doesn't seem like much, that dish of pasta, piece of bread, and orange juice box were a huge sacrifice for him. But he did it because we are guests in his community and that's the kind of guy Shefi is. I was honored to say the prayer for our meal before we ate and then we ate and laughed for a long time. It was my first meal on the floor of a refugee camp and a meal I will never forget. Ask any one from our group and they'll have a plethora of stories to share about the love and hospitality that we have felt from the refugees at the camp. I think it's safe to say that we went there expecting to change their lives, when in reality, it has been them who have changed ours. Tomorrow we head to another camp for a 24 hour shift. We will show up at the refugee camp located in the town of Skala Skiminia at 7 AM and will leave our shift the next morning at 7 AM. This is the camp located closest to the beach where they will immediately take refugees arriving on boats after they come ashore. 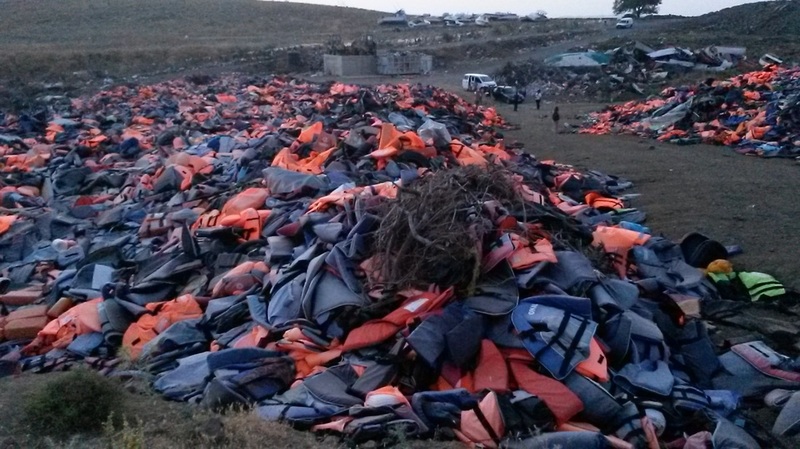 The amount of work we will have will depend on the amount of refugees arriving during our shift. It could be a lot of work, it could be a little work. 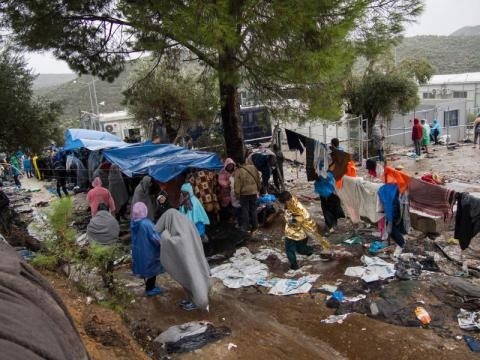 As previously mentioned, the majority of refugees who arrive by boat on the island of Lesbos are arriving on the north shore, which is mere kilometers from the shores of Turkey. It is so close, we can see Turkey across the sea from our hotel windows. 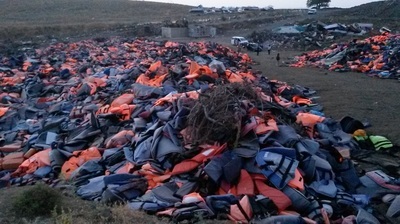 When these refugees arrive, there are normally between 25 and 50 total passengers on a boat that is suited for less than 10. They are jam packed. 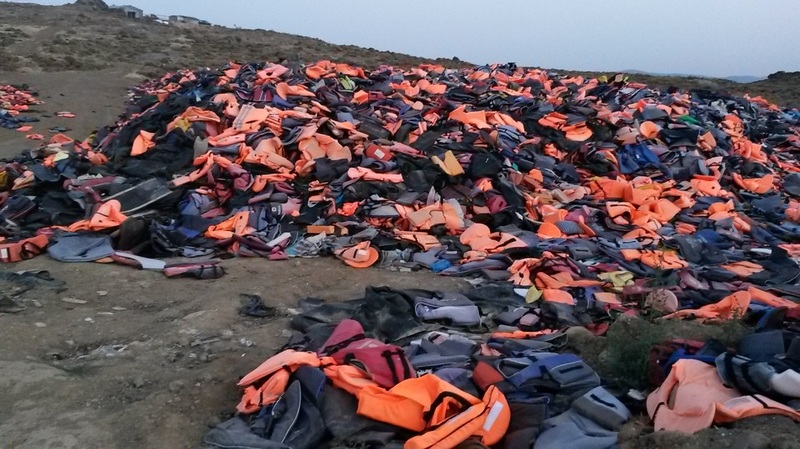 Some have life jackets, some have flotation devices, some have inner tubes, some are left without. When the boats arrive safely on shore, a lot of the paraphernalia that was used on the way over, such as the rafts and life jackets, are left scattered upon the beach. Large scale clean-up operations have sought to remove these items from the beaches and deliver them to large landfills. The three large areas where life jackets are stacked up were actually three huge craters that were dug to hopefully fill with debris and then cover. However, the number of life jackets largely exceeded the size of the three craters, creating the gigantic piles you see today. It was a very emotional moment for every one on the team and surely an unforgettable image that each of us will never forget. Today started our week-long shift at Moria Camp, the largest receiving camp of refugees on the island. The camp is actually being run in what was a former federal prison. Moria is technically owned and run by the military but it is organizations like Euro Relief (who we are working with), UNHCR (United Nations High Commission for Refugees), and many others who are doing the heavy lifting so to speak. There are many tasks and responsibilities to be done here. Volunteers, like us, do most of the work. And there are never enough volunteers. Some of the tasks done by volunteers here are distributing essential supplies like water, tarps, new tents, blankets, and diapers among other things to families and single mothers. Clothing has to be sorted and given out while doing "door-to-door" welfare checks. Another responsibility of volunteers is to be on construction crews. This is the job I had on our first day. One of the cool things about the camp and those living there is that a lot of it has been constructed by the refugees themselves. There are whole areas that have been commandeered by a particular nationality and they have "made it their own." Those living here have taken the initiative to keep up with general maintenance in their area. It's a wonderful way for them to feel empowered despite their situation. I started my morning by meeting a group of about 10-15 Eritreans. This group, largely composed of men, have fled the tumultuously war-torn political situation in their home country of Eritrea, which is located in Eastern Africa bordering the Red Sea. One of their men came to us this morning looking for some tools to do some construction. Myself and a few others took some tools over with them to help them with their work. They were adding some tents to their area and needed to level some very rocky land. Upon arriving, we met two very kind gentlemen named Johannes and Imanuel. They welcomed us into their large covered area, made us very comfortable seats on the ground, and talked to us for about an hour while their friends worked with our tools. We asked many times to help with the construction, but they insisted we sit in the shade and rest. Johannes has spent many of the last years of his life on the run. Fleeing Eritrea, he journeyed through Sudan, South Sudan, and finally to Uganda for two years in a refugee camp. 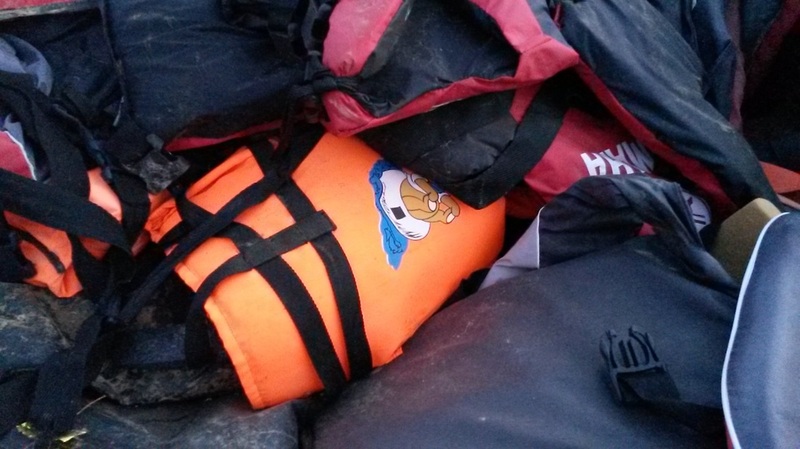 Seeing a potentially better situation, he then fled Uganda for Turkey where he made his way over to Lesbos. He and his family have been in the camp for three months and still has heard no word on his paperwork for asylum in Europe. After that, a large group of us spent the rest of the day doing a task for the UN. They came through today and declared that most of the blankets that the refugees had tied above their tents for shade had to come down. They are fairly thick wool blankets, and with the temperatures reaching the high 90's, the UN was concerned the wool blankets would overheat the area, potentially even catching fire. On top of taking them down, they gave us very large plastic tarps to hang in their place. These tarps were not only cooler but they are more durable and weather resistant. Our work started in a primarily Afghan area of the camp. After about 10 minutes of working, we had a crew of Afghan men who were eager to jump in and help, even taking ownership of the project from us. It was a beautiful thing to see. These men felt so empowered with the resources and it was wonderful to see them helping take care of their community in that way. It was also great to get to interact with them in such a manner. After done with their area, we moved to a primarily central African area of camp where we were met with the same diligence, eagerness, and hard work. In total, I probably heard that phrase today over 100 times. Men, women, boys, girls, all of them. Every time we greeted them with a smile and a hello, their immediate response is "Hello, my friend!" Every time they came to us to request something from us, we were always "my friend" to them. They see our yellow vests and the "Euro Relief" name on it and automatically know that we are there for them. I look forward to hearing that phrase many, many more times this week! Until next time, my friends! Due to the nature of the camp and the safety and well-being of the refugees, photography by staffers like ourselves is not allowed in the camp. However, below are some images of the camp I pulled from Google. Status Upon Arrival: Tired, But Excited! It's currently 9:10 PM here in Mithymna on the Greek island of Lesbos. Our group just enjoyed a beautiful three-course meal provided to us by the wonderful staff at the Hotel Orfeas. It's been a very relaxing evening, but the last 48 hours have been a fast, furious, tiring, exciting, invigorating, and any variety of other relevant adjectives. 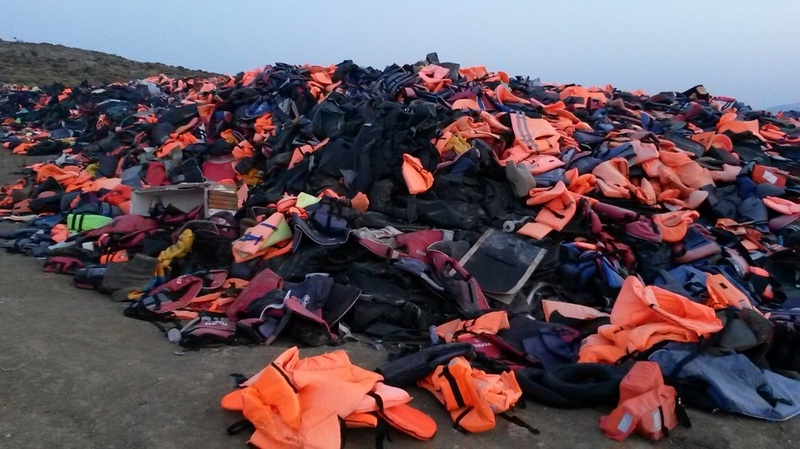 At 6:30 this morning (Sunday, June 19th), our ferry pulled in to the port of Mylitini, the capital city of the island of Lesbos. Over 40 hours, two airplanes, a bus, a taxi, and a big ferry later, we finally stepped foot on the island that we will be serving on for the next week. We arrived shortly after sunrise and were lucky to be greeted with an incredibly beautiful day on the island. Once we arrived in town, we got some great lunch and received an orientation on the nature of our work on the island. We can now confirm that we will be working in a refugee camp with direct contact to refugees. It was a wonderful thing for us all to hear. 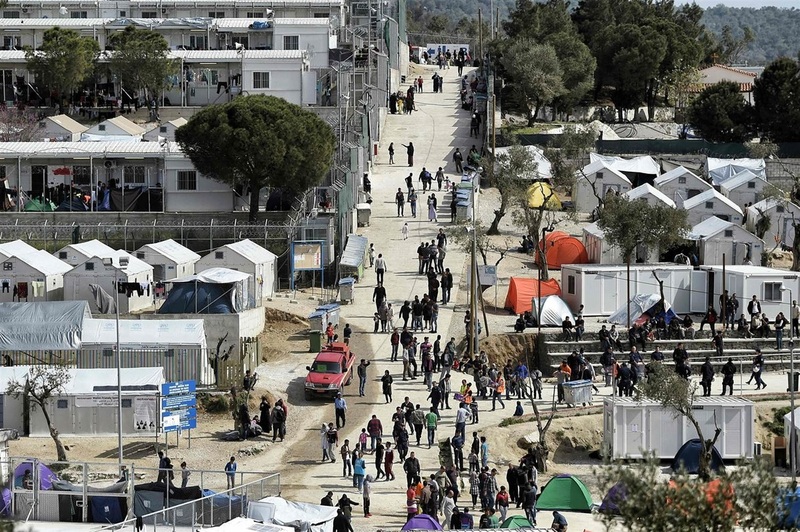 We will be working in a large refugee camp just outside of Mytilini, known as the Moria Refugee Camp. This camp is currently home to thousands of displaced refugees from the Far East, Africa, the Middle East, and even the Caribbean. However, of the thousands of refugees in the camp, 55% are Syrians who have fled from the brutal civil war that has been going on for over 5 years. Many of these came in the rafts and dinghies across the sea from Turkey. In fact, our orientation started late this morning because a new raft from Turkey had just arrived on shore with over 50 refugees aboard. They are still coming, however it is now happening at a much slower rate than in previous months. I will be able to update you more in the coming days as to what exactly the refugee camp is like. Over the next two weeks Teach Global Ed is excited to have Ryan Churchward as a guest blogger. Ryan has taught for the last 8 years in Burleson, Texas. Before that, he taught in Mexico City for a year. He was awarded the Texas Computer Education Association (TCEA) Teacher of the Year for 2016 and most recently was named the Burleson ISD Teacher of the Year. This fall he will be teaching Global Studies at Trinity Valley School in Fort Worth, Texas. Besides teaching, Ryan loves traveling, playing soccer, and painting. From June 17 - 26, Ryan will be in Greece working with humanitarian organizations as they seek to help refugees fleeing conflict in Syria, Iraq, and Afghanistan among other places. While in Greece, he will be giving us a firsthand account of what is being done to help our desperate global neighbors. This nearly unprecedented refugee crisis, that has only found on and off attention in the media, will (and should) be a topic of debate during the fall US presidential election. We are privileged to have Ryan, both a great educator and even greater person, further educate and challenge us as global citizens. Feel free to offer him questions in the comments section of his posts. Depending on his internet access and time, he will answer as many as possible. ​Our crew sets out from Dallas/Fort Worth International Airport on the afternoon of Friday, June 17th. Nearly 10 hours after taking off, we'll land at Frankfurt International Airport in Frankfurt, Germany. ​After a short layover in Frankfurt, our crew will embark on the next leg of our journey, leaving Frankfurt International Airport and arriving at Eleftherios Venizelos, also known as Athens International Airport, a short 3 hours later. ​Once home to the famous Greek philosopher Aristotle, Lesbos is now home to over 86,000 permanent residents, as well as thousands of other temporary residents (we'll get to these residents in just a minute). It is a popular tourist destination with beautiful beaches, fine dining establishments, luxurious hotels and amenities, as well as a rich history. 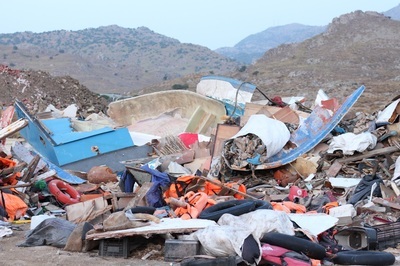 ​In recent years, the island of Lesbos has been a landing spot for thousands of refugees fleeing the crisis in the Middle East, most notably from the countries of Syria and Afghanistan, although thousands more are fleeing war-torn countries in Africa as well. What exactly we will be doing on the island, we do not know. However, we do know two things: One, there is much work still to be done. Two, we and anyone else willing to aid in this mission, are NEEDED. We will be working with an NGO (non-government organization) which has been given the task of overseeing a welcoming center in the village of Skala Sikamineas. The Sykanimia center is responsible for the northern-most coast, a strip of about ten miles, 6 km across the water from Turkey. When the refugees and migrants arrive at the center, they are welcomed at the gate, given dry clothes, fruit and water, first aid where needed, and sheltered until buses can take them to the first registration camp. In recent weeks, the group has been given the task of working alongside unaccompanied minors living in the camp. I hope to be able to bring you first-hand details of the on-going situation in Lesbos as well as accounts of our work among our struggling global neighbors. If you have any questions, please feel free to comment and I'll do my best to reply to all or as many as I can. Since many students are having trouble viewing the videos on their school Chromebook, I've attempted to find a work around. To view some Georgian videos, click on each of the links below. Awesome Georgian Birthday Celebration - We should start this in the States. 1. Do they always wear clothes like that or are those just for school? The clothes you see them wearing are their uniforms. They wear clothes like American kids wear when they aren’t in school. Not many hoodies though. I only saw one while I was there. 2. Do they make their McDonald’s food different than America? If so why, Explain. I’m not sure how they make it. It didn’t quite taste the same, but I don’t know why. When I asked if they get their ingredients locally, they said that everything was imported. 3. What does their food and houses smell like? How do their beds look and feel? The only houses that I visited were apartments called flats. They look like apartments in the States. I didn’t notice a smell except for when food was cooking. They eat a lot of bread, cheese, and beans. It was really good. As for beds, I didn't stay with a family. Only in hotels. Two of the hotels were really nice and comfortable. The other was neither nice nor comfortable. 4. Why so modest with the way they dress? Do they act modest? Or is it just a look? Are they nice? What’s some of their names? Can they get tattoos? How do they do their hair? Whats their money look like? Is it in poverty? Georgians are very nice. People were friendly and helpful when we had questions. We also received many gifts. So many, I couldn’t bring them all home. Some common girls names include Nino, Tiko or Tika, Mariam, and Natalia. For boys, Giorgi, Luka, Yakup, and Zaza (like Zaza Pachulia for the Dallas Mavericks) are common. I did see a few tattoos on some people while walking around the capital, Tbilisi. They seemed to be mostly in their twenties and otherwise dressed “hip.” The hairstyles of most people seemed similar to American hairstyles. I did notice that girls in school didn’t seem to have their hair “styled.” But most women did. 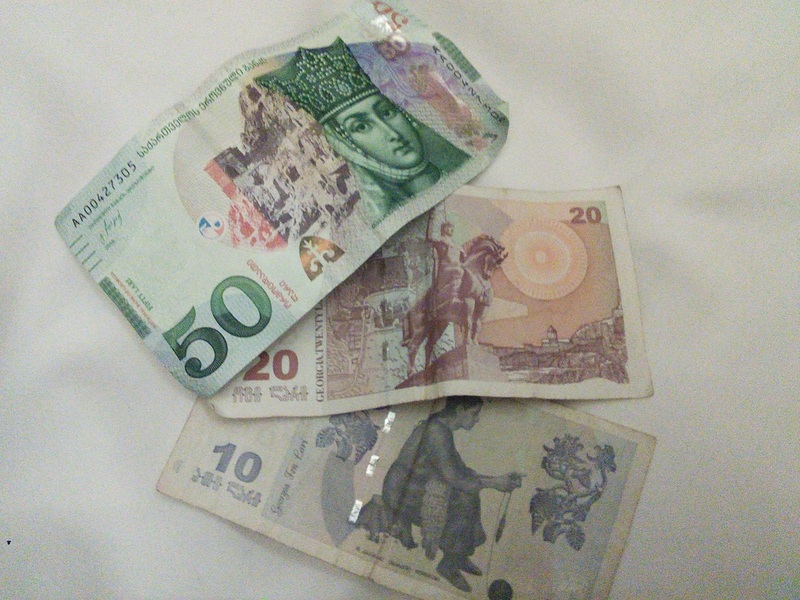 Georgian money is called lari (lar ee). Below is a picture. Many Georgians do live in poverty. The cost of living is far less than in the US. That means most things cost less, so you need less money to survive. There is a high unemployment rate so many college graduates don’t have a job or have a job that isn’t in their field of study (for example, a lawyer drives a taxi). Below is a video of traditional Georgian dancing. The clothing is traditional as well and is only worn during festivals or performing this type of dance. Stephen Blan teaches US History at Fort Worth Country Day in Fort Worth, TX and is a 2015 Teachers for Global Classrooms Fellow. "This website is not an official U.S. Department of State website. The views and information presented are the grantee's own and do not represent the Teachers for Global Classrooms Program, IREX, or the U.S. Department of State."